The New England Grange Building has openings for volunteers during the 2009 Big E. As many of you know, we operate a country store and craft sale during the Fair as well as hosting and welcoming many visitors and Grangers from throughout New England and beyond during the 17 day run of the Big E. Volunteering is fun and rewarding, a great opportunity to promote our Order and tradition, and also support the entire Grange organization. We need people to run the cash register, chat with customers and visitors, help with programming, keep the shelves of jams and jellies well stocked, sweep and dust, open and close mornings and evenings, and just do whatever tasks come along. Whether you can help out for a day, a week, or all 17 days we need you, and would like to hear from you. Perhaps someday you might like to be the building manager, plan next year’s jelly and jam order, or promote the Grange experience at the BigE! The past few years have been very successful. Our treasury is up, the building looks great and is in excellent shape, craft sales have sky-rocketed, and many Grangers have helped keep the momentum growing. This is a great time to get involved! And, while no one gets paid for any of this, we have been able to help with the expenses of volunteers who spend at least a few days helping out. Naturally, admission and parking fees are taken care of and time is scheduled so you can enjoy the rest of the Fair. In addition, for 2009 we are planning to reserve room in a nearby hotel to accommodate those away from home. 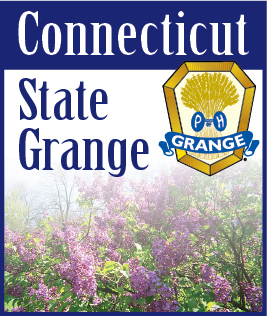 Please call your State Master to tell us that you want to be a part of the New England Grange Building at the BigE! Thank you.